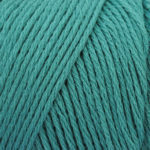 Light and airy Cotton Fleece has other cotton yarns beat! a yarn that is both soft to touch and delightfully resilient. and drape for every knitted garment.